I currently have a Current USA orbit marine light. It is definitely not enough light for the tank. Instead of buying a new light, is it possible to add t5s? What would work? I was thinking of the retrofit on brs but not sure if it would work or how to go about doing it. Any advice appreciated thank you. Definitely change the bulbs out though. What length tank is that? I can't remember. I didnt even think this would work. The tank is a 36". Is there an alternative for the 36? Honestly, I'd just switch it all out. 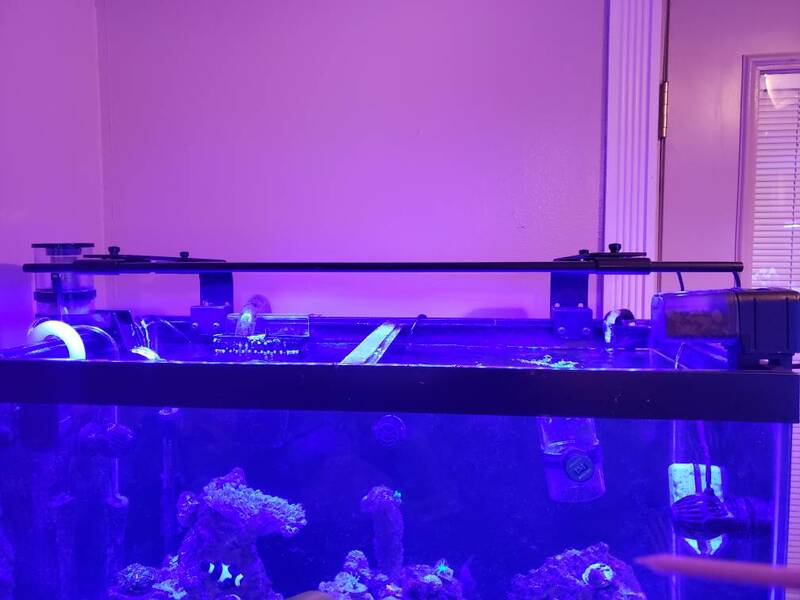 There are lots of inexpensive reef lighting options now. You may end up paying more going retrofit vs a nice used fixture. I wouldn't totally scrap those lights. I run them at 100% and get good results (but my tank is only about 10" deep.) According to the manufacturer, you should be getting around 100 par at the bottom. I'd just keep the sps up high and just supplement with additional LED strip lights like reefbrites. Those t5 retrofits are a bit of an eyesore unless hidden in a canopy. Thank you everyone. I am actually not trying to grow sps but it doesn't seem to grow much. It doesn't even register par with the par meter. I can grow xenia decently well lol. I want to add more zoas but they don't grow in that tank. I was hoping to add more lighting to spur growth. The height of the tank is about 2 feet. The AquaticLife T5/LED hybrid fixture might be configurable in a manner that would allow you to mount one or both of your current fixtures. If you turn it all up to 100% you should be getting enough par to at least grow softies, LPS, and lower light sps. The par meter didn't read anything with it turned up to 100%? I currently have the blues at 100%. Red/Green/White at 10%. Par reads nothing. If you don't like a whiter spectrum aesthetically, you can have it turn up the whites during the day when you're out of the house and have it switch to a mostly blue sunset interval. You're probably using less than half of the par the fixture can produce by only running blues. I'd definitely start there and see if growth picks up. Otherwise, as previously mentioned, either the AquaticLife hybrid or Reefbrite XHO might be good options to boost the intensity without getting rid of the existing lights. So from what I have read, i thought the white, red, and green does not produce growth as blues and purple. If you look at any spectrum that are recommended for growth, those are generally turned down very low. If I boost the white, green, or red to 100 during the day, wouldn't I just end up with algae growth? No, not at all. Photosynthesis (whether zooxanthellae in corals or algae) utilizes light across the visible spectrum to varying degrees. In fact there is a substantial chlorophyll absorption in the red end and a host of accessory pigments that can funnel energy from other parts of the spectrum into the photosystems. It really wasn't until the advent of LEDs in the aquarium hobby that anyone was running spectra that are this heavily blue. Metal halides and t5s often have significant emmision outside of the blue end of the spectrum. Shallow reefs get very white daylight sun. It really isn't until you get 60+ feet down that the reefs really start to look more blue. You may get increased algae growth, but there is a good chance that would happen with any increase in light. Contrary to popular belief, algae use blue light too. What meter were you using to measure PAR? Regardless, some level will be present. I wouldnt go making big changes until you figure out why you didnt get any results. 6500k MH are known to be one of the best growers of corals, they just dont display the corals in a flattering manner (the reason most LED users run them with heavy blues). 6500k MH are known to be one of the best growers of corals, they just do﻿nt display the corals in a flattering manner (the reason most LED users run them with heavy blues). I used the one loan by WAMAS. I was able to read par in my other tank using the Hydra so I know it is not broken. I have the entire set-up with the light (pump, flow, etc.) so I am not sure if I want to completely trash it. I thought about just selling the entire set to someone and start all over with this tank. This is a light at bought mainly for fish but would like to grow some corals now. I’m neither a light expert nor familiar with those Current USA led. But if the retro fit package costs more than $100 without the bulbs, I would rather ditch the whole thing and switch to a more capable led. Even an el cheapo Marsaqua unit like mine has no problem satisfying BTA at only 30-40% blues and 10-15% white. Is there a RAZOR unit for sale here? That’s even better than mine. I have a feeling that is what I need to do. Just didnt want to do it since its connected with the pump, wave makers. But the light is just not as efficient as I want it to be. Great for growing most softies. Great for growing most softies. ...and sps/acros with the whites turned up under the right circumstances. You dont think this is a bit foolish? Overall color doesn't do well under extremely blue lighting. Sure, it will look nice initially but good luck keeping that color long term if you're only running the blues. Additionally, even with only the blue channel running, you would have some resulting PAR. Fair enough, just trying to help. I didn't know if you were married to the 100% blue aesthetic all day long. I was just trying to find a way for you to keep the light since it seemed that is what you wanted in the original post and all your pumps are on the loop system too. I think you still can keep them by just s﻿upplementing with more blue LEDs and/or t5s. Thank you for your help. I run the other spectrum but at a very low level. The tank is also quite deep so adding some T5s will help a lot when I place corals at the bottom. I have T5s on my SPS tank and corals are doing great in there, thus the preference for this tank too. I'm not sure this is a true statement. Many tanks and many retailers developed tremendous color exclusively under 20K radium lamps for years and continue to do so today. Looking at the spectrum for a 20K Radium , you'll see that it's got a huge spike at 450nm (blue) with much, much lower components outside that range.